The forth weekend in succession on which I explored rindos with my new cyclocross bike. This time, I headed for Chichibu. Despite a particularly early start, leaving home at 5:45am, the Tamagawa was already crowded with people. 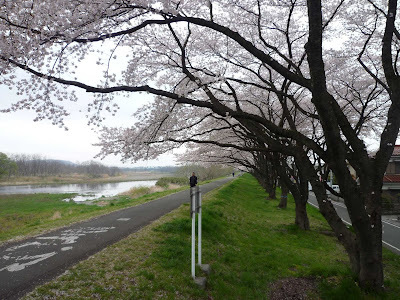 And not because of the cherry blossom in many places - actually these were the most deserted parts. I noticed quickly that I was still not fully back in form, having been down for two days with a virus mid-week. 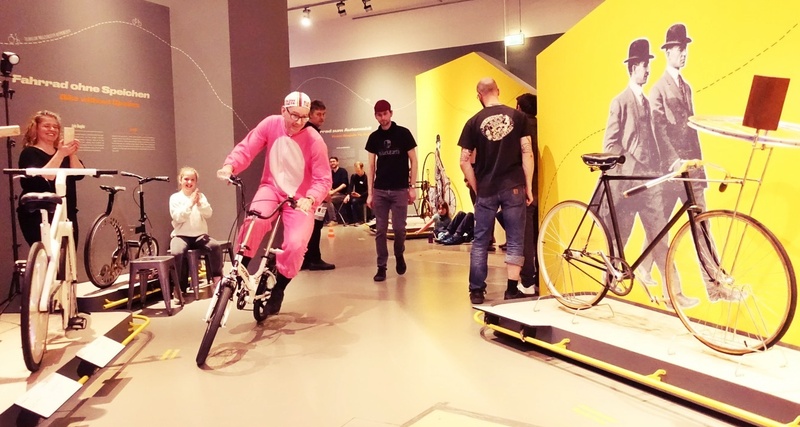 I had difficulty pushing my heart rate above 150 - or rather, I didn't even feel like trying. But cycling at moderate speed (not made better by significant head wind) was still fun, so I kept going. 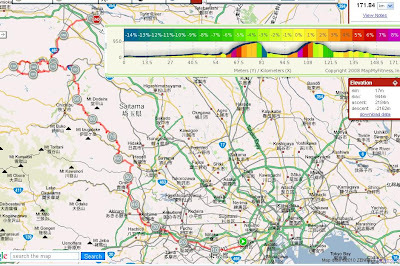 I explored a new route onto the Green Line (see GPS trail below), going from Ome to just before Hanno, then turning up the Irumakawa valley, turning into the valley leading towards Nennogongen, but taking the first rindo turning off to the right and over a 300m pass down to Higashi-Agano (on route 299). Route 299 was full of nasty truck traffic as usual, but I only had to cycle 200m upward on the pavement before turning off to the right into a nice valley and then rindo leading up to Kouburi Toge (500m), the start of the Green Line. From there the rindo continues as everybody knows over various "passes" reaching up to 900m. It was nice climbing with little traffic. The sun had finally come out, and I found myself overdressed in what was still basically winter gear. At Ono Toge, instead of turning right as we always do towards Shiraishi Toge and Sadamine Toge, I left the Green Line to the left, heading towards Kenminnomori. Saitama needs its forest just as Tokyo needs their own (Tominnomori). This rindo was also well paved, and easily accessible by road bike. 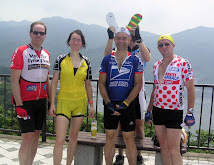 In fact, I saw a group of riders who must have made it up from Chichibu city. Instead of turning down towards the city, I kept going, passing by a camp side protected by a friendly guard man, direction of Nagatoro. Beyond the camp side, the rindo falls down steeply, first unpaved (but in decent condition so manageable even on a road bike), then paved. My hands became quite tired from all the breaking, so steep and long was the descent. At one point, I got off to check the heat of the wheel rims, and almost burnt my hands. I felt the rubber melting and losing grip. The paved surface was rather uneven, so I couldn't go faster than 30km. What a waste of mass! I prefer to spend accumulated altitude on a fast downhill! 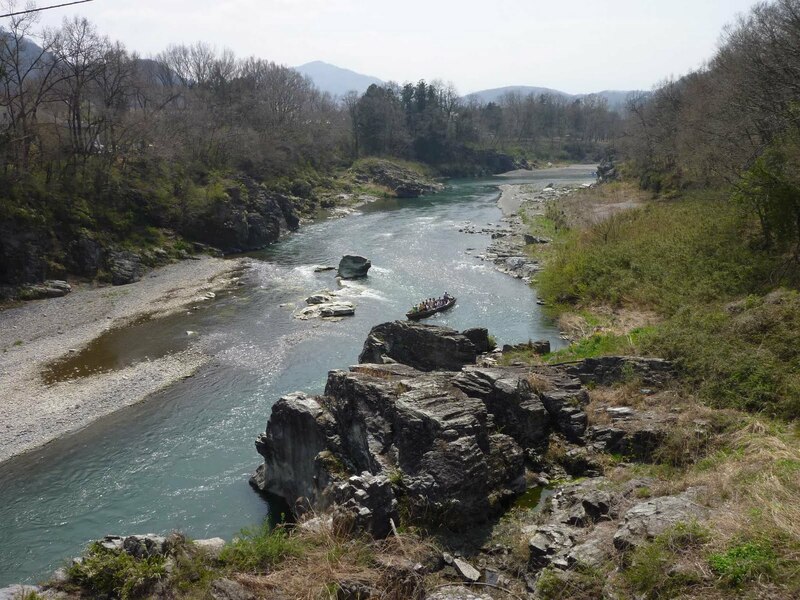 At the foot of Sadamine Toge, I turned north, passing the Nagatoro gorge on its right. People were enjoying the by now really beautiful spring weather going through the gorge in boats. 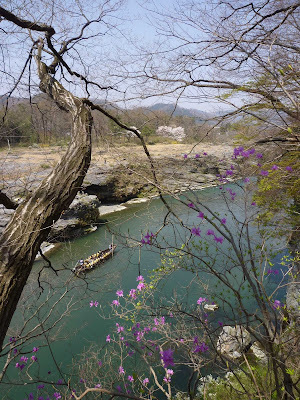 Lots of nice photo opportunities, of landscape and also a lot more cherry trees. Every stop made me realise that I was really not in great shape - I felt the exhaustion even though I had not really pushed myself that hard. 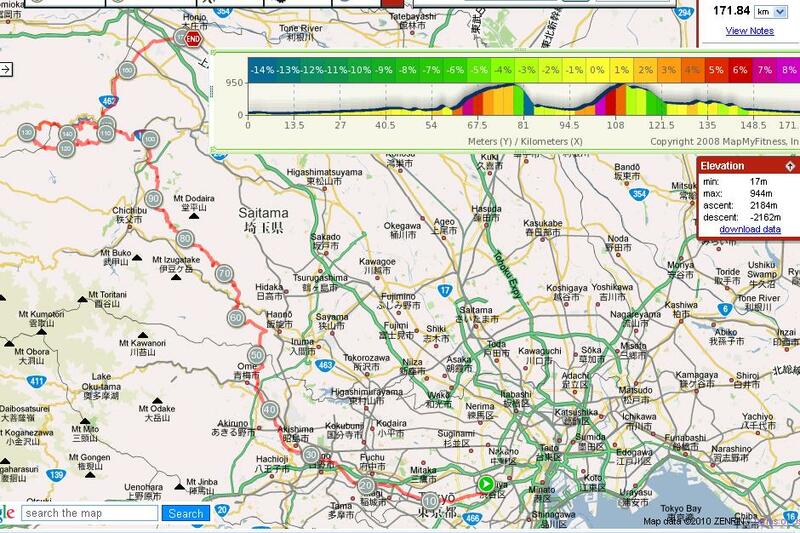 At a 7-11 stop in Nogami, I decided it was best to take the shortest route to Honjo-Waseda and spend the rest of the afternoon resting at home, perhaps getting in shape to head out with the PE crew the next day. I had rewarded myself with an onigiri and Black Thunder, when I was approached by an older woman offering me another rice ball that she and her husband had left over. I took it gladly, and it was delicious, a lot more so than the usual 7-11 variety. It looked home-made. The guilt of the extra calories convinced me to keep going - for another round into the mountains. 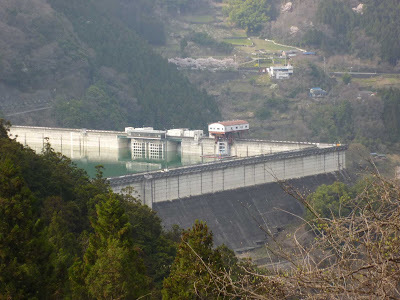 My plan was to head over to the Shimokubo dam lake and take the rindo leading from there to Shiozawa Toge, then run down to Tomioka. 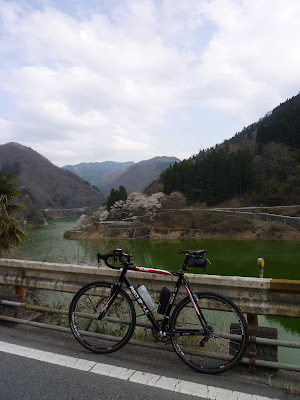 All worked well until I missed a turn into a rindo that was meant to take me down to the dam, and instead kept going upwards on a rindo that was running parallel to the lake on its south side. I realised the mistake only 50 altitude meters or so after the turn, but decided this one was also worth exploration. 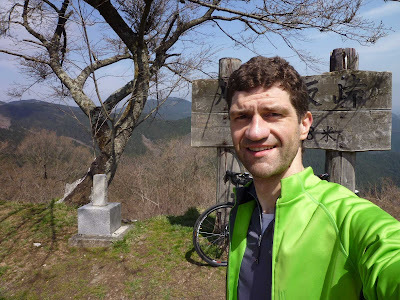 The rindo keeps rising ultimately up to 980m, and then leads on in various ups and downs around the ridge of the mountain range to Tsuchizaka Toge at 700m, one of the many passes from Chichibu into Gunma which I have taken before. I took route 462 along the valley towards the lake. Traffic was moderate, but rather too many noisy motor bike groups for my taste. So I left 462 to take what is essentially a badly maintained rindo, running on the other (south) side of the lake. 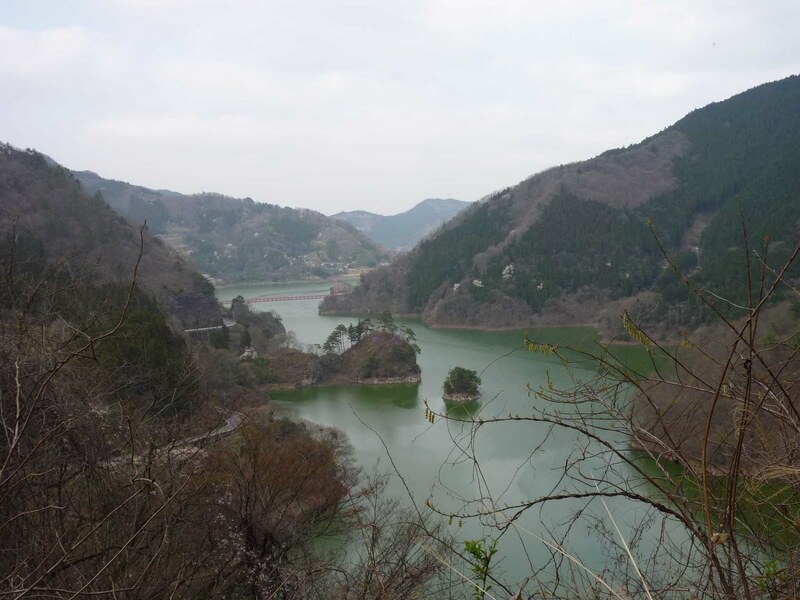 Unlike the kokudo though, it runs deeply into some of the valleys running into the lake, and has several climbs of up to 150m each. I passed by a nice natural fountain and replenished my water supply. Less nice about it was the fact that somebody had dumped their sodaigomi in front of it. Unfortunately, the rindos in this area were full of such sights/sites. 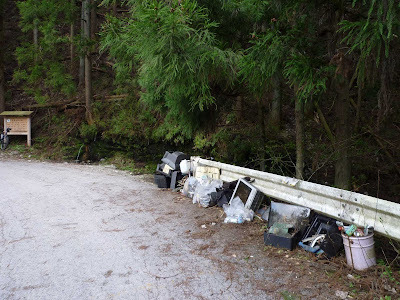 Unbelievable that people ship their trash out into the mountains instead of paying a few hundred yen to have it collected. Such sorrow sights were compensated by plenty of stunning views of the lake and its small islets. The dam wall looks like the fortress walls of a Japanese castle. Beyond the dam, I thought it was all just a straight downhill into the village at the bottom of the valley and then a fast run to the station. None of it - more up and downs! 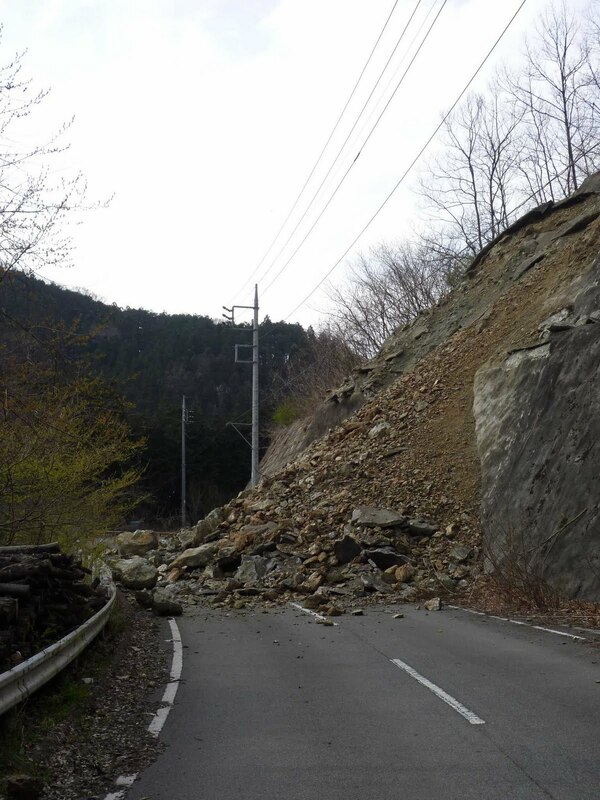 And a landslide that blocked the entire road - an invitation to the cyclocrosser to walk over it! Then another building site - road blocked to traffic! Well, when has that ever been an obstacle? This time, however, there was a huge gap in the road, with a five meter cliff straight down. Building workers busy with their work, and not noticing the sole cyclist towering over them. I thought it was pointless calling their attention as this would just risk them telling me to get lost from where I had come. Instead, I worked myself up a steep hill, through grass and bushes, and then down again, right into the building site, to the utter surprise of one of the workers, who was so speechless, he couldn't say anything. Which was just as well, so I could get on speedily. The remaining barrier of the day was one for a bird rather than myself. 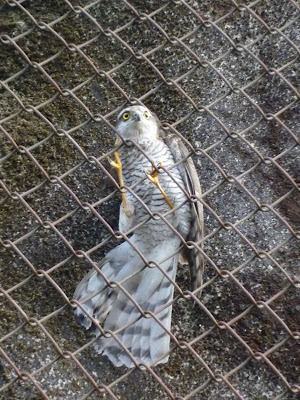 A young prey bird had got trapped behind the fence securing a wall of rocks along the rindo. I managed to secure a larger whole at the bottom of the fence by inserting between fence and rock a PET bottle from another one of those trash dumps right opposite. 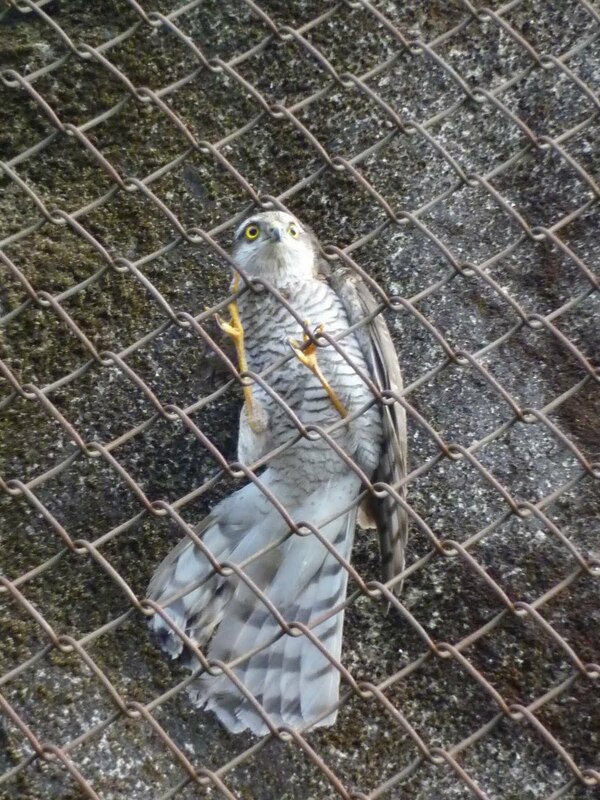 The bird had fled my help attempts to the upper parts of the fence, and I can only hope it eventually found its way out. I myself found my way to the station rather easily, this time avoiding route 462 altogether, and going to Honjo rather than Honjo-Waseda. A Takasaki-Hiratsuka direct train took me to Shinjuku in just one go (and 1.5 hours). 185km with 2,800m BBiT in altitude gain. 11.5 hours on the road, of which 8.5 on the bike - i.e. I had taken it rather easy. Beautiful phot of Nagatoro with the azalea. Must have been a scary sensation the rubber tires about to melt from all the generated heat. Very wise you stopped for a cool-down...I'm sure you were in for an explosion had you continued your descent! Dynamic Fitness on the Move!